DESCRIPTION: CLEAN BRITE easily removes solid color or semi-transparent oil based stains and water sealers. CLEAN BRITE will also remove damaged and discolored wood fiber from all exterior wood surfaces, decks, wood siding and log homes. DIRECTIONS: CLEAN BRITE works upon applying. 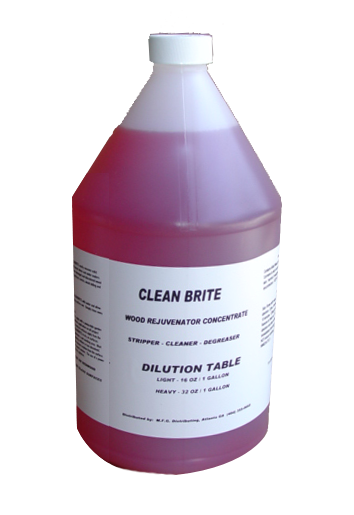 Dilute CLEAN BRITE with water up to 9 parts (makes ten gallons). 9:1 will cover 2000 sq. ft. It stronger mix is needed, use 8:1 to 1:1 mix. For best results a minimum 1500 p.s.i. water pressure is needed for rinsing; in many cases residential water pressure is not sufficient to clean roofs. In such cases, use a low pressure, pressure-washer. Be sure to rinse this product - We recommend using our product Deck Wash Pro after cleaning with CLEAN BRITE. The Deck Wash Pro will neutralize any chemical left on the wood. If you do not neutralize or rinse thoroughly after using CLEAN BRITE your new top coat of stain will break down. 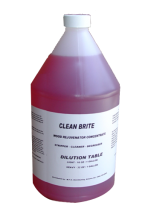 Mix CLEAN BRITE with water and allow CLEAN BRITE to work keeping surface wet. Simply rinse away carbon and grease. WOODEN DECKS & SIDING, VINYL SIDING & FIBERGLASS: Use 3:1 strength on failed wood stains or heavily grayed wood. Apply diluted solution liberally with a pump-up garden sprayer to all areas to be treated. Mist area to maintain wet working area - do not allow drying on surface. Once coating softens, usually 15-30 minutes Agitate lightly with a stiff brush or floor broom to help remove residue. Work in the direction of grain to minimize “grain raising” on wood surface. Finally spray cleaned deck thoroughly with a garden hose or power washer to remove any cleaning residue. Rinse twice if needed and brush with the grain of the wood. For best results a minimum 1500 p.s.i. water pressure is needed for rinsing, In many cases residential water pressure is not sufficient to clean roofs. In such cases, use a low pressure, pressure-washer. TO CLEAN CEDAR SHAKE ROOF: Follow above instructions. Do not walk on shingles or shakes unless safety equipment is used! TO REMOVE MILDEW, ALGAE, LEAF & DIRT STAINS FROM CONCRETE: Dilute 4:1 with water. Spray on generous coat, wait 15 to 30 minutes. Either brush & rinse with hose, or pressure wash. Will not remove rust or motor oil stains. TO REMOVE BLACK STREAKS FROM PAINTED GUTTERS: Dilute CLEAN BRITE from 12:1 to 15:1 depending on type of paint and age. Test on a small area for correct mix. Adjust mix to suit job. Spray surface. Wait 10 minutes pressure wash.
TO REMOVE OLD PAINT, STAIN OR SEALER FROM DECK: Spray on 4:1 mix, wait 10 minutes. Thoroughly wet deck with water. Wait 10 minutes and pressure wash. Note: If used on painted, stained or sealed surface, test to be sure it will not harm coating. Continue to dilute with water until safe mix is found. DO NOT USE ON ACRYLIC MATERIALS. NOT FOR USE on bare aluminum and glass. Rinse immediately off glass or aluminum to keep from etching. Rinse surrounding plants with water, before and after application. WARNING: Contains Alkali Metal Hydroxides and 2-butoxyethanol. Corrosive to skin and eyes. May be absorbed through skin. Harmful if swallowed. Use with rubber gloves and eye protection. KEEP OUT OF REACH OF CHILDREN. SKIN: Rinse with .water. If irritation persists get medical attention. EYES: Immediately flush with water for at least 15 minutes. Lifting eyelids occasionally. INHALATION: Remove to fresh air. If condition complicates get medical attention and start artificial respiration. INGESTION: Immediately drink large quantities of water or milk. DO NOT induce vomiting. Get medical attention IMMEDIATELY. Click the button below to add the Clean & Brite Stripper & Cleaner to your wish list.